I was talking this morning to Sean from Zimbie, a spinoff from WIT’s TSSG group, about their Zimbie applications and services. Although it took me a while to get my head around it, and it is still in early stages, Zimbie is a nice idea whereby you can send notifications via IM to anyone who is interested in your blog or other online content (at the moment, it mainly works through RSS updates but I am told it will be extended to include other update methods). Think Twitter or Jaiku via IM, except for any content (not just microblog entries). Client. Basically, there is a Zimbie client and a Zimbie bot. I am not sure if the client application is needed for those who don’t want to run Zimbie bots, but it acts like a normal Jabber IM client. It uses Jabber, so is compatible with Google Talk, but has yet to be extended to other IM protocols. Bot. The Zimbie client is required if you want to set up Zimbie bots (“Zimbots”). The idea is that you create a bot that will notify anyone who adds the bot to their IM contact list about any updates to your site (or set of sites). So, in the screenshot below, I set up a Zimbie bot for barcampgalway at gmail dot com. Then, I configured the bot with details of my RSS feed (in this case, for the BarCamp Galway blog). Anyone who adds barcamp at gmail dot com to their contacts lists in their Jabber-compatible IM client will be notified when the BarCamp Galway blog is updated. Voila! 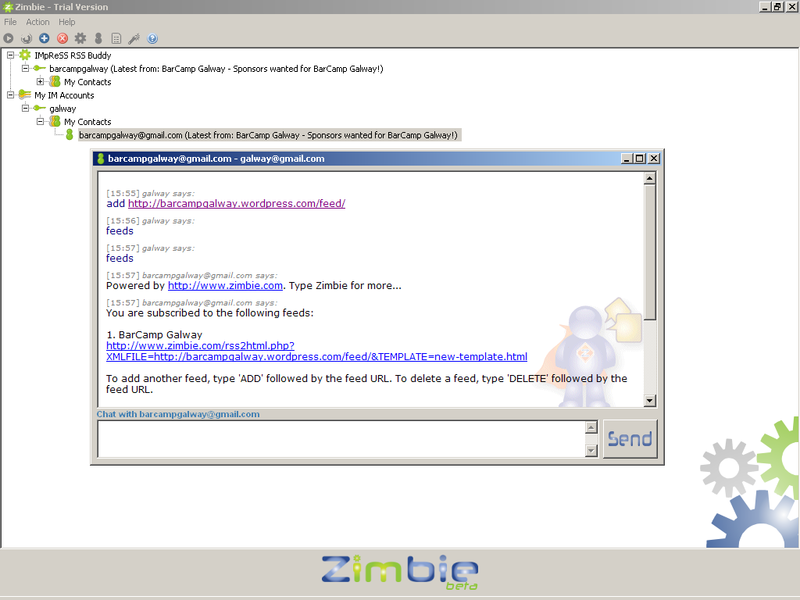 The Zimbie client is easy to install and use. The Zimbie bot, less so. It works just fine, and the Zimbie bot demo video does a good job of explaining how to set up a bot, but I think that this may be a bit complicated for most, and editing XML is okay for someone like me, but may not be to all tastes. I also assume you must either leave your Zimbot running or else people will only be notified of updates when you start your computer / Zimbie application running again, but that’s not a big issue and will suit most. But it is still an early release, and it’s really nice to see applications and ideas like this coming out of research institutes. Well done, and I wish all at Zimbie success with it. You can keep up to date with developments at the Zimbie blog. I have one running for the boards on http://www.upthedeise.com and its working well. I use PHPBB and just installed the RSS plugin to XMLise the boards. So I set up a Zimbot to watch the GAA forum. Works really well with the forum.